Our Find a job service was created in just 5 months in partnership with external job search engine specialists Adzuna. The service, which helps people find full-time or part-time jobs, replaced Universal Jobmatch. 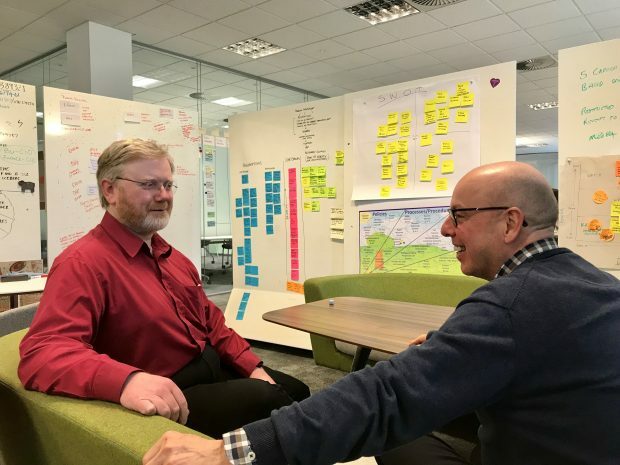 I worked with our Leeds and Sheffield based digital teams on developing the service. Find a job offers a self-service site for jobseekers with fast, simple and comprehensive job searches and personalised accounts where CVs can be uploaded and email alerts created. What sets it apart is trust and transparency. Employers who post vacancies on the site must be verified to ensure vacancies are genuine. Checks are also made to ensure employers meet National Minimum Wage standards, Welsh language compliance and accessibility requirements. Since its launch last May, more than 46.8 million advertisements have been viewed on the Find a job site, making it one of the government’s most popular digital services. The Find a job website played an important part in the external employment campaign ‘My Way In’ that shares stories and advice from people in work and employers all across the UK. More than 9,000 jobseekers visited the My Way In website after clicking on a link to the site from Find a job. And more than 20% of visitors to the My Way In website clicked through to Find a job. We’ve also worked with colleagues across the department on other campaigns such as Summer Jobs, Disability Confident, Christmas Jobs and Flexible Working. The core service was built by Adzuna but we are gradually improving it based on our own research with colleagues across DWP. It’s really refreshing working with a small company. Together we replaced one of the busiest digital services in government in just a few months. I’m a product owner and I lead a design team of business analysts, user researchers, content and interaction designers. Together we create a prioritised backlog of user stories based on user needs and data analysis. 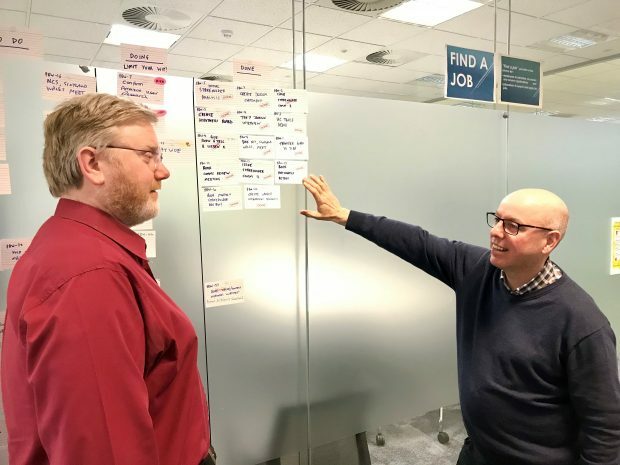 Using a digital Kanban board shared with Adzuna, we can develop these together, ensuring they are fit for purpose before being released to our approximately one million users. Features are released as soon as they are ready – multiple times per week. The live service is monitored by our product support managers who interact with employers and jobseekers on a daily basis. Direct service support is delivered by dedicated operational teams in London and Glasgow. This cross site work is supported by a customer management system that allows the product support team to monitor the progress of thousands of customer queries and issues each week. We’re now looking at developments over the next 12 months, for example, how we can improve the quality of advertisements from employers using the site so they and jobseekers can find the best fit. We’re attracting attention outside of DWP too. David Birdsall, Principal Software Engineer at the BBC, commented on the ‘amazingly fast to load’ website speed. More than 14.6 million job applications have been made on the site since its launch which is encouraging and we’re keen to build on this success. And we’re extremely proud that it’s been shortlisted for Best Public Sector Project in the National Technology Awards, a UK-wide event which celebrates pioneering technology to be held in May. If you’re interested in working with us check out the latest vacancies on our careers site.